Welcome to our personal web page. We hope you find the information we provide here useful. Most of our early life was spent in California. Until 1995 we lived in Santa Cruz, where we raised our family. Terry worked for over 25 years at the Lick Observatory as a research engineer designing instruments for astronomy research. His final project was to design the electronics for the 'HIRES' spectrograph that was installed on the new Keck Telescope. Shortly after his retirement he was asked to come back to do the initial design for a new spectrograph named 'Deimos'. That instrument just saw first light in the spring of 2002. For those of you technically minded there is more information on these instruments here. Nancy worked as a Learning Handicapped teacher for the Soquel school district. We were both active in High Street Community Church, Habitat for Humanity, and our local neighborhood organization. 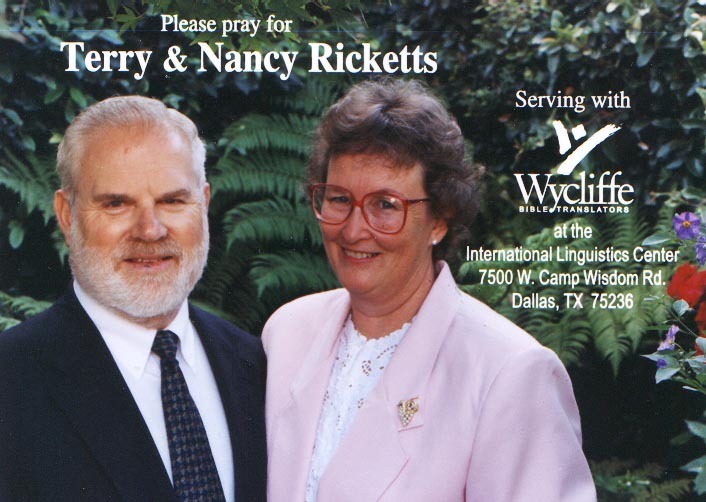 Once our children were grown and gone we both took early retirement, joined Wycliffe Bible Translators in 1994, and moved to the international headquarters in Dallas, TX in 1995. Terry now serves as the computer network administrator for the International Publishing Services department. His department is responsible for publishing all the translated bibles (over 460 so far) and the academic books produced by the translators. Nancy was a Career Counselor. If you are interested in learning about Wycliffe there are some links on the left to all of our related organizations. If you would like to make a donation to Wycliffe for our ministry, or for the ministry of another missionary or Wycliffe project click here to go to their secure web site. Since moving to Texas we were active at Faith Bible Church for 11 years, where Terry taught an adult class. Since moving to Midlothian, Texas in August, 2005 we have become active at Midlothian Bible Church and are making new friends there. After Nancy retired from Wycliffe in April 2005, we started a farm at our 13 acre property where we raise alpacas and Angora Goats. We also help international students at Dallas Baptist University, which is close to us, to adjust to American culture and to learn English. Our jobs often require us to travel to other countries for extended periods. In 1999 we spent 9 months in Papua New Guinea. In 2001 two months in Togo introduced us to West Africa. In 2003 Nancy spent 2 months in Burkina Faso and Togo, both in West Africa. We both worked at the Horsleys Green center in England in March and April. We most recently worked in Cameroon, West Africa, Jan - March of 2005. We send out a prayer letter about 4 times a year to those interested in hearing about our ministry here and would like to pray for us. A copy of the latest issue is included here. You can read it online by clicking on the link to the left. Note that it is in Portable Document Format (PDF) and you will need a 'PDF Reader' to read it. Adobe makes one that is freely available for all computer platforms. You can download a copy by clicking on the Adobe link.